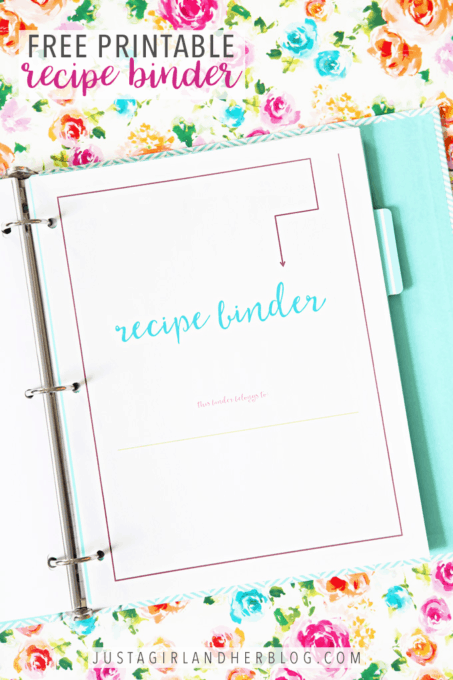 This free printable recipe binder will help you organize your favorite recipes all in one place so you can always find the one you’re looking for! I confess, I kind of dread meal planning time. It always takes me forever to decide what meals my family will have over the coming weeks because I can never seem to think of things to make, I feel like we’re eating the same things all the time, and I just didn’t have a great system (or any system!) for coming up with our meal plan. As is typical when I have an organization problem that I need to solve, my first instinct was to create a printable. I happened to be reading through my friend Toni’s book, The Complete Book of Home Organization (which is excellent, by the way! ), when I came upon her suggestion of creating a recipe binder, and I knew it would be the perfect solution to my meal planning + prep dilemma. 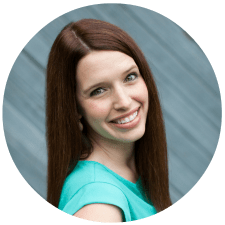 My recipes had been stored all over the place– on Pinterest boards, in files on my computer, in various folders in my kitchen cupboard– they were a mess! 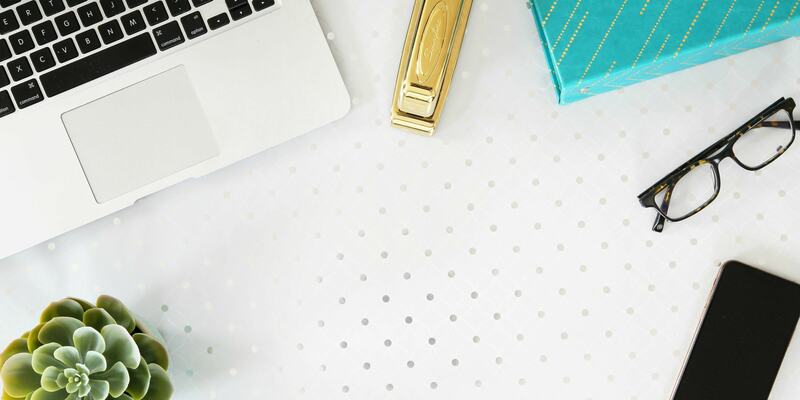 A recipe binder would help me corral all of my favorites in one place so that when meal planning time came, I could just grab the binder and instantly have tons of meal ideas at my fingertips. AND when it was time to actually make the meal, I had the ingredients list and instructions ready to go! But if I was going to create a pretty recipe binder I couldn’t just keep it all to myself, so I decided to share it with you too, dear readers! 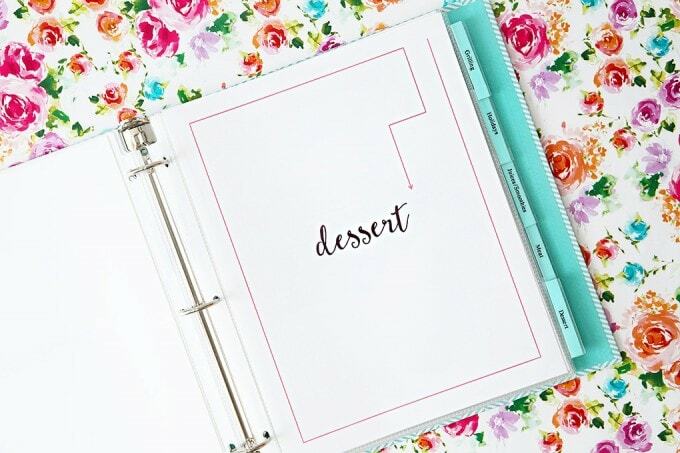 The printable binder includes the cover shown above, as well as cover pages for 14 of the most common recipe categories and a blank cover page to customize to your own liking. To assemble the recipe binder, I simply printed my cover pages on white card stock and slid them into a clear sleeve with a tab like these ones. I used my label maker + clear labeling tape to create a label for the tab, popped them into a binder, and I was ready to add my recipes! I love that I have all of my recipes organized in one place now– it makes meal planning and prep so much easier! I’m always amazed at how a simple binder system can really streamline a process and save a lot of time. Woot! 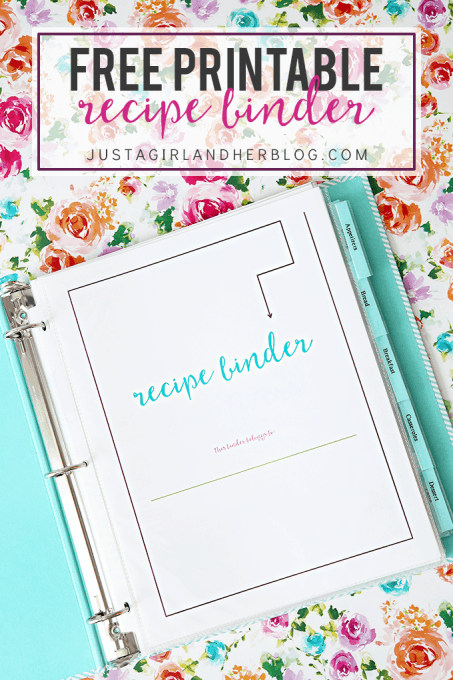 You can click the button below to have the recipe binder (and some bonus recipe card printables!) sent straight to your inbox! What is your favorite way to keep your recipes organized? I’d love to hear about it in the comments below! 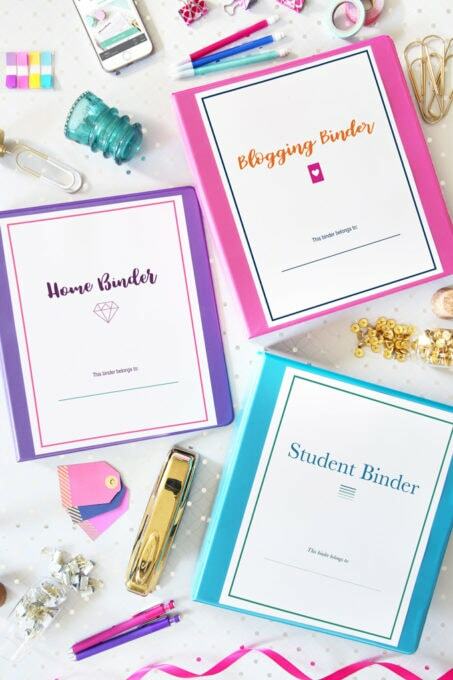 And if you could use even more pretty printables, grab these other fun binders too! Ahh!! 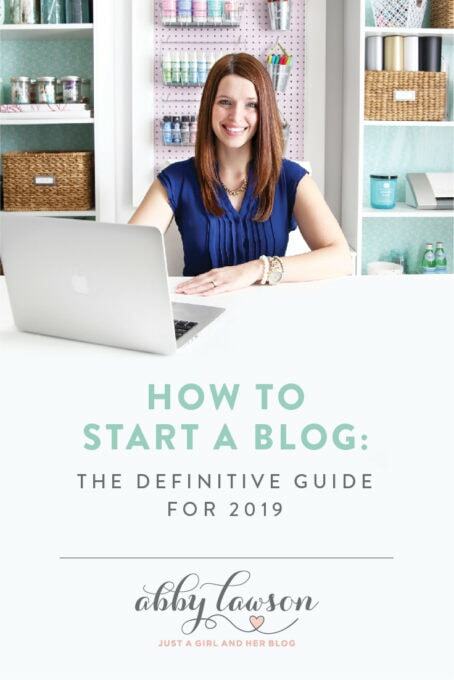 I just jumped over to Amazon to check out the book and it looks amazing! 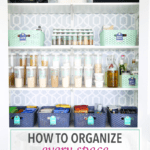 So bright and beautiful and so many organizing tips! I’m going to stop over to IG so I can check out this giveaway! Thanks Abby! 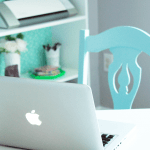 Ps: I love your floral background for your printables photos! Is it gift wrap? I love the recipe binder. It is so beautiful! This is definitely better than the recipe cards I have everywhere. Now I have to consider it. Thanks for sharing. I love this idea! A good friend gave me a beautiful tin recipe box for Christmas and I’m so excited to corral all my favorite recipes in one place! I can only seem to find a paperback copy of the book. Are there hardcover ones available? Hi, Jennifer! The book is just available with the flexicover, which is a higher quality soft cover. I hope this helps! Have a great weekend! I love how your recipe binder turned out, just beautiful, having it all your recipes in one places makes all the difference! Thank you so much, Morgan! It really does! Hope you have a wonderful weekend! Where do you buy your notebooks? 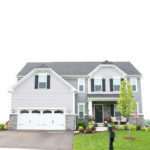 Like the one here? Hi, Sandi! This one is from the See Jane Work line, and I found it at Office Depot. 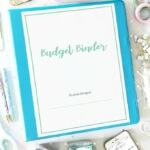 I have links to a bunch of my favorite binders at the bottom of this post: https://justagirlandherblog.com/simplify-home-binder-tour/ . I hope this helps! Have a wonderful day! I made a recipe book for my niece as a wedding gift. It is an inexpensive vinyl photo album that holds two 4×6 photos to a page. I found this album at a dollar store. I bought pretty printed 4×6 recipe cards and hand wrote special recipes to be inserted in each photo pocket. The really special part of this recipe book is I asked other members of the family (hers and his) to write their favorite recipes and sign the cards I gave them and return the cards to me. If the recipe was handed down through the family, I wanted each contributor to write that on the card; such as “great-great-grandma Lona’s sugar cookies”. I also included measurement conversions and cooking tips. I hope that one day she will pass it on to her granddaughter with even more recipes added. What a beautiful and special gift! I’m sure she really cherishes it! 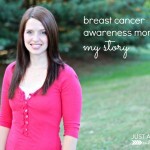 Thank you for sharing the idea, Kimberly!! I received my copy on Friday and I LOVE it! I plan on lending it to my 18yod (if) when she moves out. 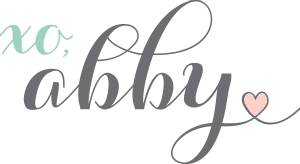 Thank you Abby for all your wonderful printables! Isn’t it fantastic?! I feel like I want to reorganize everything now! 🙂 Have a wonderful week, Nancy! Abby, what font did you use to write the recipe headings? I’d love to fill in the blank pages one using the same font as I have a few different categories I’d like to make, such as the Instant Pot. Or, could you make one titled Instant Pot? Thanks! Hi, Jennifer! The font is called Sugarbush, and I bought it at creativemarket.com . 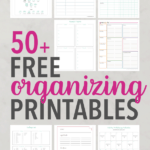 There should be a blank sheet included in the printables so you can make any other headings that aren’t included in the pack. Have a great day! THANK YOU SOOOO MUCH! I know this will come in handy on all of those busy nights! This will also make a great gift for the college student that is living in their first apartment! So glad it was helpful for you, Colleen! Is it possible to tell me the name of the font that you used for the recipe binder and where it came from. I just printed all the cover sheet pages and I apparently do not have that font on my computer. The words came out all garbled. I really like your binder and would love to use it. Thanks for all the work that you put into this. Hi, Rhandi! I’m so sorry it’s giving you trouble! The font is called Sugarbush, and I got it from Creative Market. I also just emailed you the recipe binder file directly to see if it will work for you that way. With a PDF, you shouldn’t have to have the font on your computer for it to work, and I know a lot of other people have been able to access the binder with no issues, so I’m not sure what’s going on! I apologize again for the inconvenience. Hope you’re having a wonderful week! You are very kind to share your wonderful discoveries. I have 2 recipe binders that are in desperate need of overhauling so this is perfect timing. I have too many recipe for just one, so I have one for Savoury and one for Sweet, which works really well. It’s going to be my special job for the next school holidays! Are you retyping recipes to go in your binder? Or are you just sticking in things you have printed out over time? 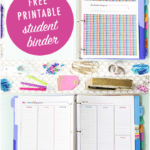 Thanks for sharing these printables with us! Hi, Christy! I typically just stick my old recipes into the binder. If I have a new one that I want to add, I like to write it out on the matching recipe pages (https://justagirlandherblog.com/free-printable-recipe-cards/) and put them in there that way. Eventually it would be great if all of the recipes could be on the matching pages, but I don’t know if I’ll ever make the time to make that happen, lol! I completely understand and agree with you! 🙂 Thanks for replying back! I have all my recipes on a USB drive. I used to keep them in a binder but found that the USB was easier to transport. Now when I sit a my desk and think, at the last minute of course, “What are we going to have for dinner?” My Tried and True file is at my fingertips. I don’t tote the USB around with me on a daily basis but I do when I update the folders. 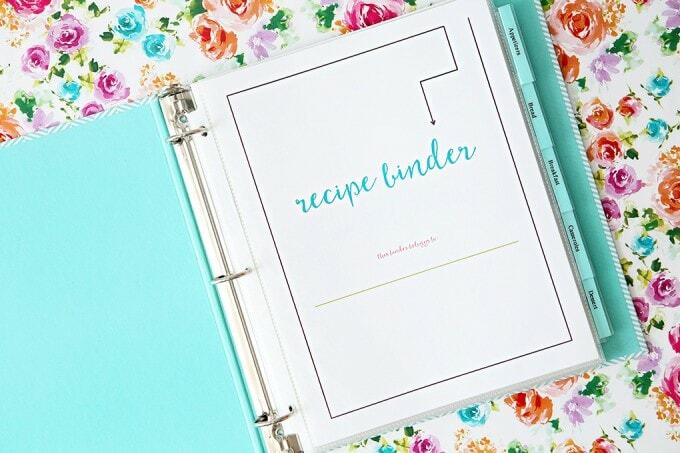 I love the look of this Binder, though and have an enormous collection of Family Recipes that have been handed down to me and I think this would be a lovely way to showcase them–with pictures of the cooks! 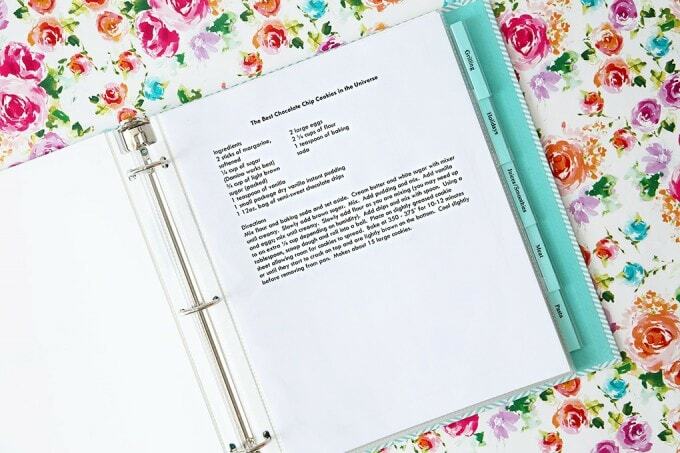 What a great idea to keep recipes organized! Beats my current system of emailing them to myself. So glad you think it’s helpful! Hope you’re having a wonderful week, Matilda!! Oh, I need to do this. It’s definitely one of those tasks I have been putting off. Thanks for sharing!